Ratnam Tarpoda (Big Size) was one amongst my mass-order purchase through my dear friend Pradeep who was travelling to Rajahmundry last year. I have bought lot of pens from different manufacturers and I have varied experiences across the three brands of Rajahmundry. For those who don’t know, Rajahmundry is one of the major city of Andhra Pradesh in India. And city consists of few of the oldest fountain pen manufacturers in India like Ratnam, Ratnamson, and Guider. Ratnam Pen Works ( KV Brahmam & Brothers) is the first “Swadeshi” Fountain Pen Company of India and was established in 1932. It was started by Kosuri Venkat Ratnam and is currently being run by one of his two sons, Siva Ratnam. They also manufacture handmade gold nibs including conical shape gold nib. Most of their pens are made of ebonite, however they also make silver metal pens and also gold plated silver pens. I have yet to see acrylic pen from them. 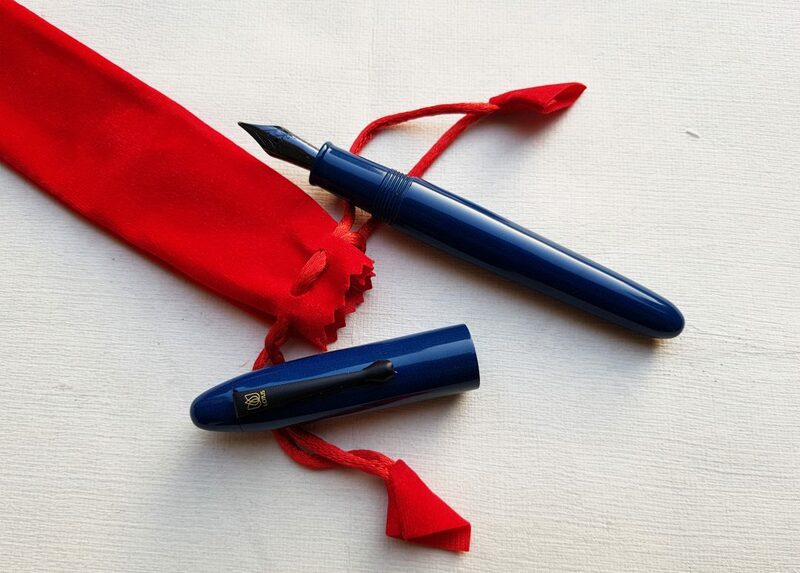 The review is about their big size ebonite pen , Ratnam Tarpoda. Here the pen is in simple, classic shaped design with rounded finials. The pen tapers down down to rounded bottom, while the cap also tapers but just slightly to finial which is shaped like parabolic dome. It bears lot of resemblance to one of my previously reviewed pen Ratnamson 302, which is a pen from different manufacturer, though in this case the cap finials tapers more towards top. The grip section is made in black ebonite unlike the body which is made in olive ripple ebonite which is famous by name of White Tiger because of the resemblance to skin of white tiger. The barrel is cylindrical and tapers both ways, towards the grip section and also towards the bottom end. The grip section in black ebonite gradually tapers towards the top with flared end at the top. The grip section is short and I end up gripping threads which actually are not sharp and rather they are smooth and provide good grip. The cap is adorned with dual bands and has a stiff ball end type clip. The trims used are gold and I believe they match with the ebonite. And it opens in 4 1/2 turns. The barrel is engraved with the branding which reads “RATNAM PEN, MADE IN RJY, INDIA”. And it is filled some sort of gold paint which I believe is not neatly done as their is spillage of gold paint on barrel which eventually will wear off with time. Overall it is a classic, no nonsense, elegant cigar shaped design and you cant go wrong with that. Finishing can be improved a little. And most importantly the turns to open cap must be minimized. The quality of material used is good and is sturdy. There is no discolouration of material. The built quality is just at par with like of Ranga or Deccan pens if not better, especially finishing. I think Branding on barrel can still be improved. What i really liked was the alignment of cap with the barrel when it is closed in such a way that the ripple effect of ebonite carries to the cap from barrel. Its a handmade pen and yes there are certain anomalies like cap finial doesn’t align in line with the tapered profile of the cap. But again what do you expect from such an inexpensive pen. As far as the quality of band is considered they are better than what I had on Ratnamson 302. But yes they still need improvement. One thing I really did not like was provision for 2 breather holes in the pen, otherwise it is well built HANDMADE pen at this price point. The pen is vary well balanced in both the scenarios when writing with cap posted or unposted. Yes, when cap is posted at back, the rear becomes heavy and will suit the one with large hands but it doesn’t becomes unbalanced at all. The cap posts securely and it post deep. Below are the 2 images showing the length till which the cap posts, outer limit shown by thumb. Below are the two images showing the length of pen when writing with cap posted and unposted. Being ebonite it is light weigh and no metal is used here. Clearly it is not that much a big pen and hence it is comfortable for most of the users. Nib used is #5 friction fit with ebonite feed. Nib is Dual tone and is well articulated with certain engraving which reads ” GENIUS IRIDIUM GERMANY”. The nib on this was better than what the Guider puts on their pens but yes not to my liking and thus I ended up grinding the nib to medium Italic and it was nib which got grind easily unlike Wality nibs. The problem is that the nib is available only in fine and no other choices. The ink filling mechanism is via an Eyedropper, well you can use syringe also. Ink capacity is around 3.5 ml, which is substantial. Since its an ED pen, there is a noticeable increase in the inflow when the ink level goes below 3/4th and that is when you will have to refill otherwise it will burp. Its like it will gives you warning before it burps. This pen though has not burped on me at all and yeah i ensure when the ink level goes below I refill it. I recommend this pen to every collector. Its an handmade pen from first pen manufacturer of India. Also will recommend to the likes who love fiddling around with their pen and know how to live around and ED pen. I bought this pen for Rs. 1000 (approx US $16 ) which included shipping last year and I believe the price might have gone up. They can be easily approached via WhatsApp ( Mob No. +91 98489 18904). They will send you pics and prices and you can select whatever you like. Pay via bank transfer and they ship once the payment is received.